Team at the Green Apple have been specially handpicked. They have been chosen because of the person they are, and not just for what they look like (which is not always the case in our industry). The technical staff at the Green Apple genuinely like what they do and it shows. Team members Barbara, Brian and Victoria have been at the Green Apple for more than 30 years and are all ageing gracefully together! Staff attrition is very low which provides a very stable environment for members. The team are fully qualified and are registered with Fitness Qld and/or Exercise and Sport Science Australia (ESSA). They remain current in the latest research and methodology within the industry and, as a group, do resuscitation annually and First Aid every 3 years. 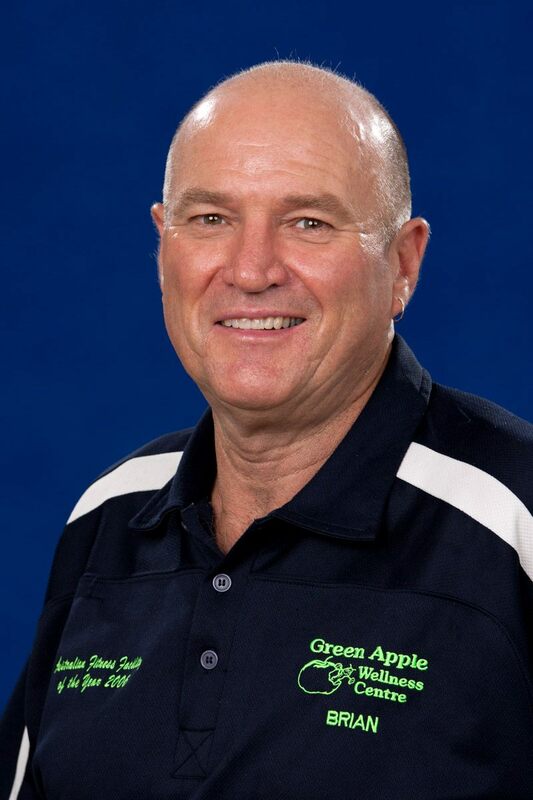 Owned and Managed the Green Apple Since 1978. My vision has been to help willing people achieve extraordinary health and happiness outcomes! 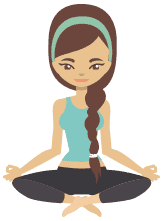 We have an integrated service of allied health, natural therapy and fitness practices under one umbrella. For over 35 years I have looked for the best people to help with this vision, and the Green Apple Team is the end result. Each team member has been specially chosen because of their attitude and passion and they are committed to learning and growing. I constantly question the “whys” in our business and “who” we look after, which helps me decide how and when to introduce services and staff to meet community needs. This is why we introduced programs for Type 2 Diabetes, Osteoporosis and heart disease more than a decade ago and this health direction has been very rewarding. We are seeing very significant results. I really want a happy environment for the Green Apple Team and every member — it makes life so much more rewarding and enjoyable. 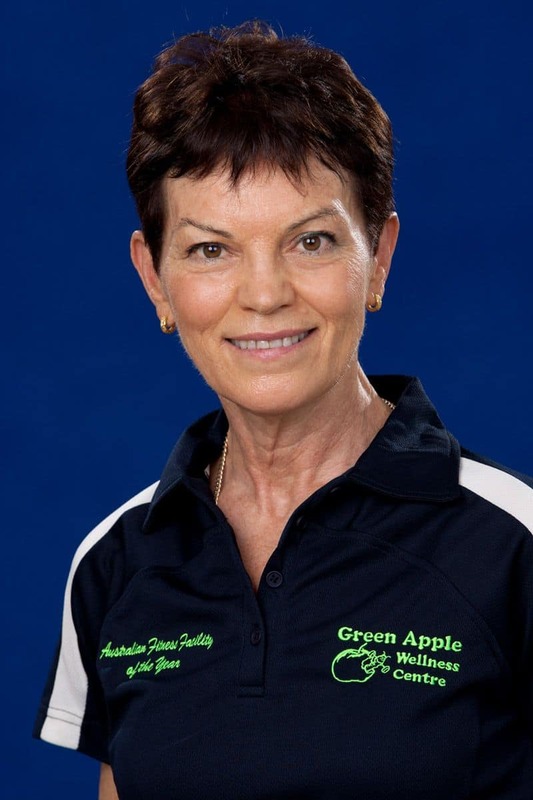 Fitness Professional with the Green Apple since 1981. I am multi-skilled and I multi-task daily. There are some great characters at the Green Apple with wonderful stories to share. It is a unique and very special place. Find a training partner you are compatible with and encourage each other as much as possible. A Healthy Meal you Love to Have? Roast anything! Vegies, gravy, tomato-sauce & mushy peas! Eat as low fat and sugar-free as possible. Ride the Lift Fitness Bike each week — aiming to do 10km in 30 min — Learn to cut down on meal sizes. Always have an enjoyable book to read and leave the remote, remote! I understand the importance of delivering best practice on the gym floor. I enjoy brainstorming with my team regularly so we are all up to date on the latest research and keep aligned with what the Green Apple is all about. Kai-Bo, a combination of punches & kicks to music. A great stress buster! What is a favourite Inspirational quote? Do you have a healthy meal or snack you love to have? Balance what goes into your mouth and how you work it out! Find 30 minutes daily for exercising — Anytime. Mark it on your calendar/diary/phone. Try to stick with this for a month. Feel the difference! Remember why you are doing this — for your own health and wellbeing! Fitness Professional with the Green Apple since 2007. I feel very strongly about what we are delivering here at the Green Apple. I am a part of an integrated and supportive team and we all pool our various strengths to make it a very special place. I also keep a vigilant eye on the cleanliness of the Green Apple to keep it an inviting place to exercise in. I do two-hour workouts three days a week and play golf on Saturdays. A healthy meal or snack you love to have? Cannot go past a big steak with mushroom sauce. Share your healthy eating tips. I eat at least 2 pieces of fruit a day. Do you have a food challenge? Treats are fine in moderation. My favorite food is apple turnover with real cream. I allow myself one per year. You can’t change history but you can be in control of your future. Fitness Professional with the Green Apple since 1987. You will see me at multiple sites in the centre. I have qualifications to look after you on the gym floor and classes including Aquarobics, Fitball, Pilates and Stretch Classes. 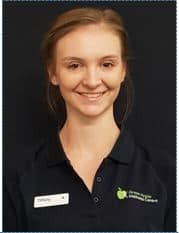 I am a registered Heartmoves Trainer which gives me specific skills in chronic conditions and Personal Training, so I am able to help you with any goals you have. On the admin side of the fence, I do payroll and help with MYOB and member management. I am never bored — always on the go! I take a wide variety of classes throughout the week as well as being available for programming for our members. I am known as “The Legend” and I just love keeping everyone happy and safe in their exercises. 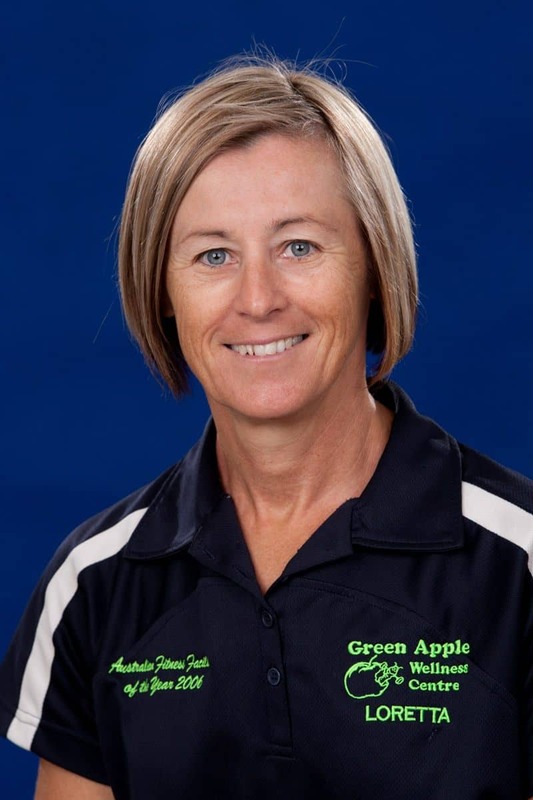 Accredited Exercise Physiologist (ESSA) with the Green Apple since 2012. I design gym and home programs for clients with acute or chronic health issues. I also provide orientation sessions for patients who are enrolling in the wellness programs at the Green Apple: Heartmoves, Lift for Life, Steady Steps and Lungs in Action. 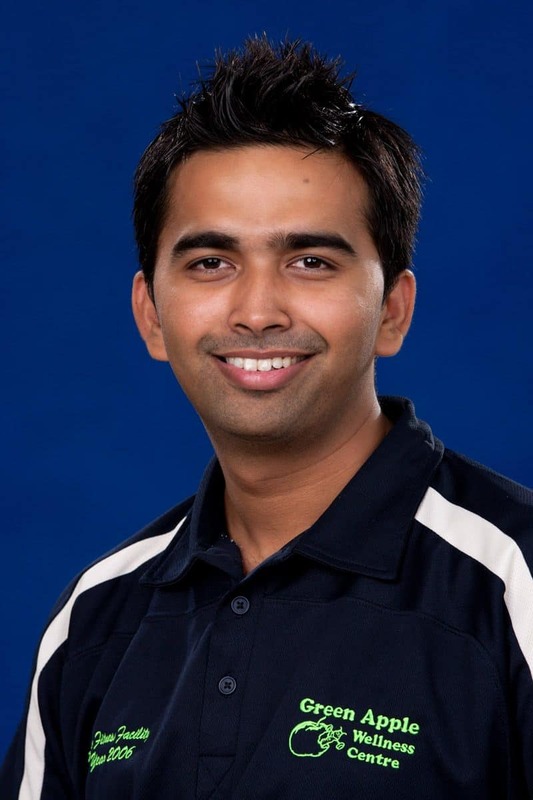 My background in physiotherapy and exercise physiology provides me with the knowledge and skill to design and deliver fitness and rehabilitation programs for clients with various health conditions. I communicate well and enjoy working with people of all ages. 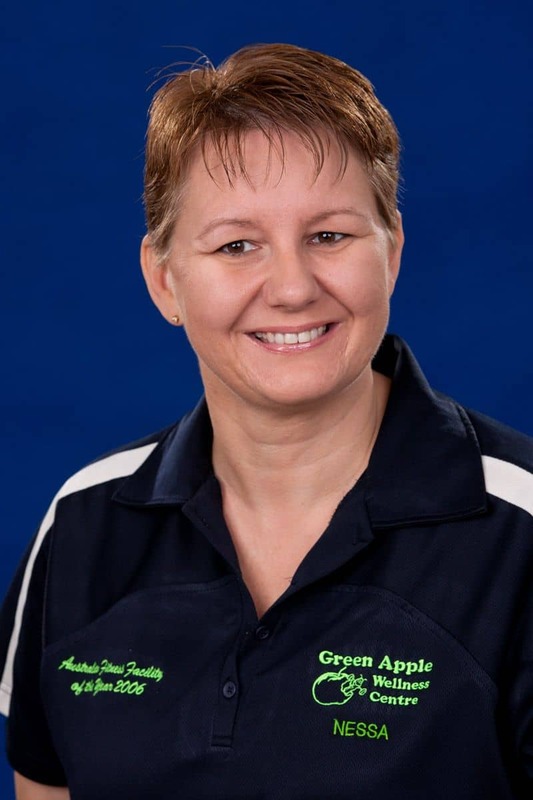 You can see me through a GP referral under Medicare, Department of Veteran Affairs (DVA), Work Cover and through private exercise sessions at the Green Apple Wellness Centre. Exercise Physiologist with the Green Apple Since June 2016. In the Allied Health Room writing reports for doctors and preparing for my clients, on the gym floor with clients having one-on-one sessions or getting a new program developed or taking Wellness Courses. Helping people improve their quality of life with exercise. I love being able to assist people in gaining improved functionality—whether it be keeping their independence or doing things that they only dreamed of! I enjoy working at the Green Apple as it has a friendly team atmosphere and everyone is willing to help out. I particularly like the whole of life approach to health and wellbeing and the impact we are able to have on so many people’s lives. With the Green Apple Since February 2017. My passion is: Helping people improve their health and quality of life through exercise and social interaction. 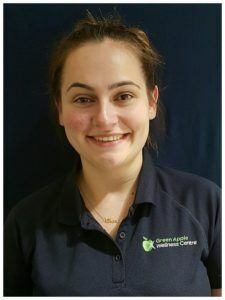 Why I enjoy working at the Green Apple: I enjoy working at the Green Apple because of the friendly environment created by the staff and clients. In April 2012 I experienced one of the scariest things you can possibly imagine. I had a stroke. 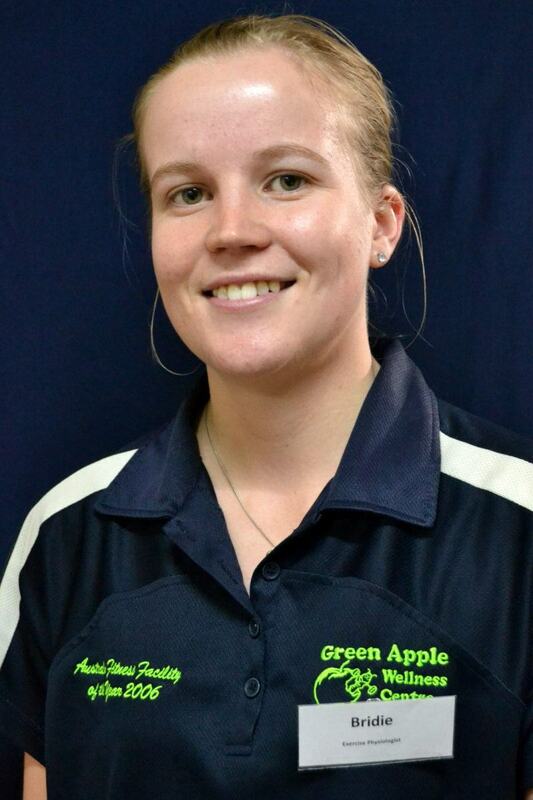 After treatment in hospital and extensive rehabilitation, then moving to Brisbane, it was a twist of fate that led me to the Green Apple. On my first visit, I was blown away, and loved it so much I wanted to spread the word about my experiences here. I approached the Principal, Victoria about my feelings and was rewarded with one of the best jobs in the Green Apple. My role entails going out to visit the doctors, practice nurses and pharmacists who want to know more about the Green Apple services and how they will benefit their patients. 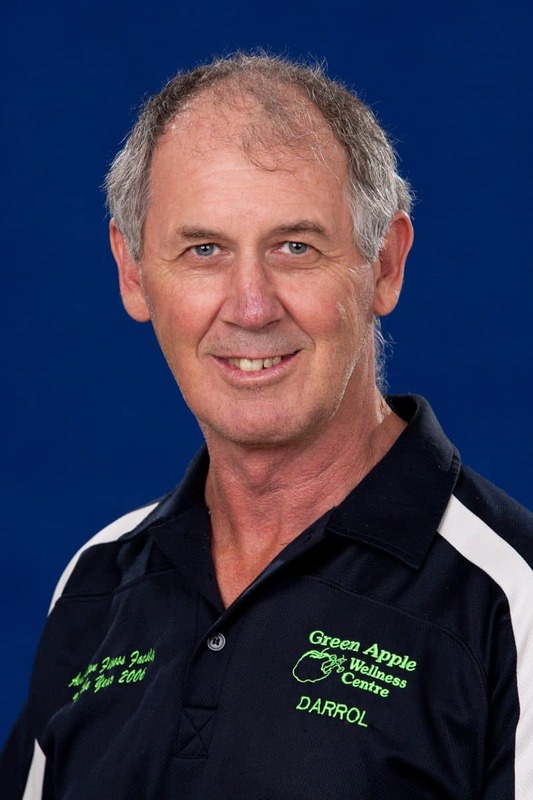 I share the ideals of the Green Apple that exercise as medicine can be used for most chronic and metabolic conditions, biomechanical problems and mental health conditions. It is wonderful to know that the Green Apple Team can make such a difference in people’s lives and I am the one to deliver the good news to the doctors about what we do! I am continually amazed at the responses from the doctors and nurses who I speak to, who are so grateful and delighted that there is a facility where they can send their patients. Not only can Green Apple meet their needs holistically, but who also genuinely care about what they do. I find my role at the Green Apple so rewarding, and I absolutely love it. I am so grateful for that twist of fate that led me here. With the Green Apple Since May 2017. Why I enjoy working at the Green Apple: The Green Apple team is like a new extended family, supportive, family and genuine. Like minded people, inspired to help others. This is a very special place, with many special people, all with their special stories. I enjoy interacting with everyone each and every day. 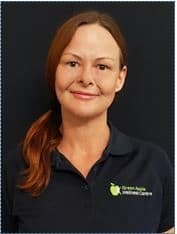 I joined the Green Apple Team as a member first before working in the Children’s Activity Room playing and having heaps of fun with all the children of members, as well as fellow team-mates and my own kids. Currently, you will see me on Reception helping members with their enquiries and meeting their needs. 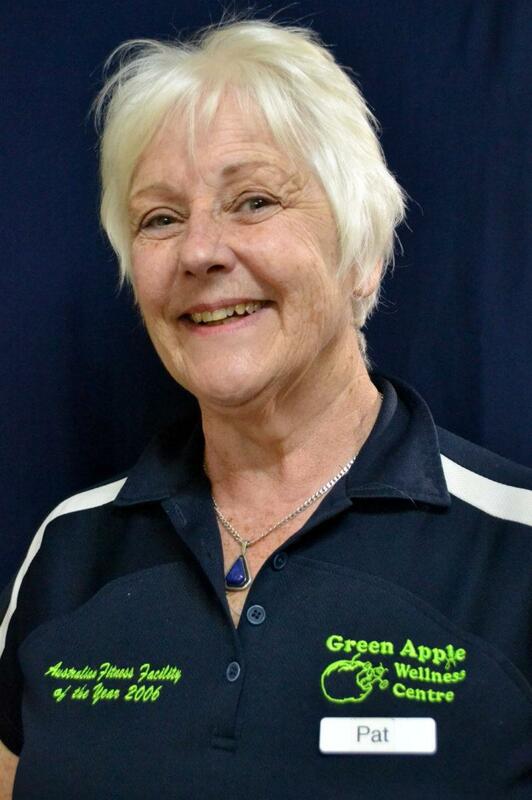 We are a great team at the Green Apple and I enjoy being part of such a wonderful group. What is Some of Your Favourite Inspirational Quotes? – Wake up with determination… Go to bed with satisfaction – I do it because I can! I go to the gym 5 days a week. My two young children keep me moving. I love fruit — I make up fruit kebabs. Great for party food, especially if you cut the fruit into shapes. – Drink water…. Heaps of water. Your body needs it and wants it! My passion beside you all at the Green Apple is photography. I’m starting my course very soon so watch out in the gym as I may just capture you in some of my photos. Reception with the Green Apple since June 2016. I have always worked in the service industry, initially as a hairdresser and salon manager. 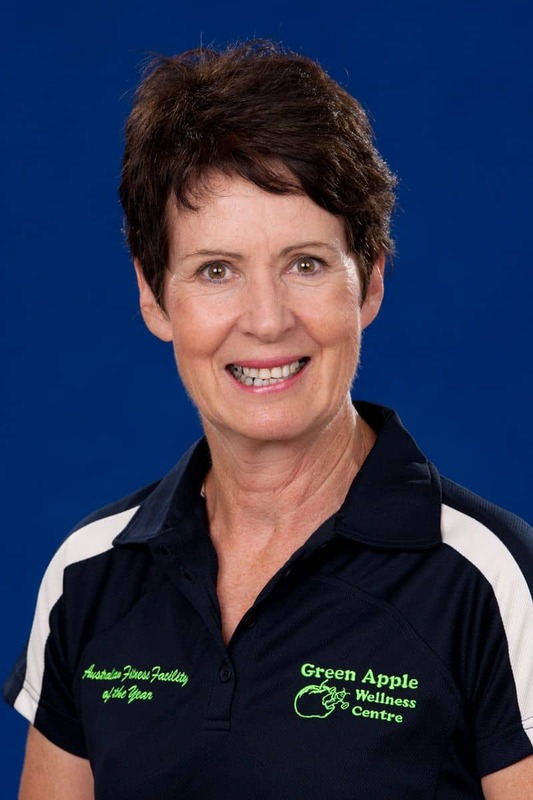 For the past fifteen years, I worked as a Leisure Lifestyle co-ordinator in aged care. One of the most important aspects of my work has always been valuing team-work. Inspiring others to be positive about themselves is key. Reception – the face of the business and the hub of everything that happens in the Green Apple! Being able to be part of a team that aids and assists people to find their way towards a holistic way of wellbeing. At the Green Apple, we all have different skill sets but together we make a strong, united force of positive energy. At Reception helping write cards and booking appointments or on the floor with new members for buddy sessions, writing new programs or taking classes, such as Aqua. The human body is amazing and I love learning about it and using my knowledge to help people live a more sustainable and happy life even if it’s just through support or a friendly smile. The Green Apple is such a supportive and friendly environment to work in.